Rotary Dryers are known for their robust construction. Rotary dryers are able achieve to very high temperature. 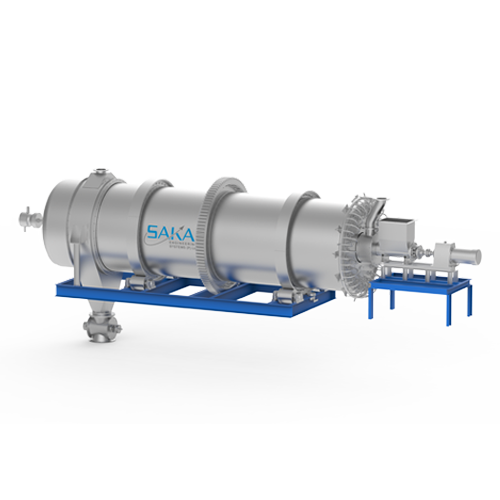 SAKA offers wide range of Rotary Dryers that are designed to deliver best output, efficiently. 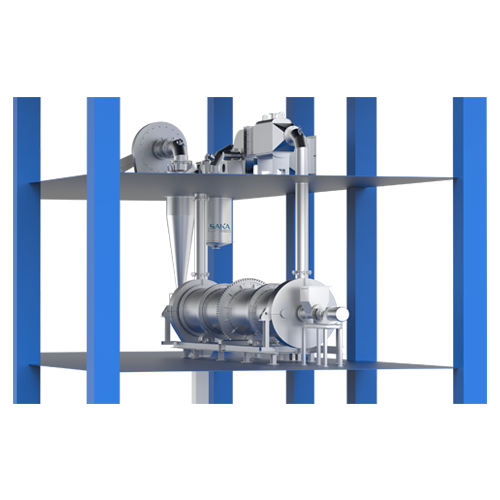 Rotary Dryers are one of the widely used Dryer in process industry. Especially in fertilizer and minerals industry for drying products such as coal, clay, gypsum, kaolin, limestone, mineral sand, potash, silica sand etc. 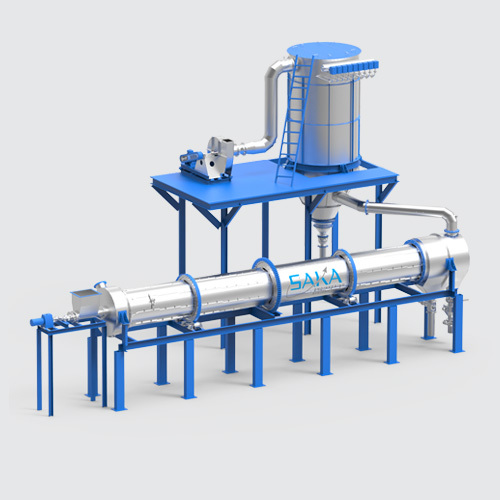 Rotary Dryers consist of cylindrical shell supported by riding rings to provide circular motion. 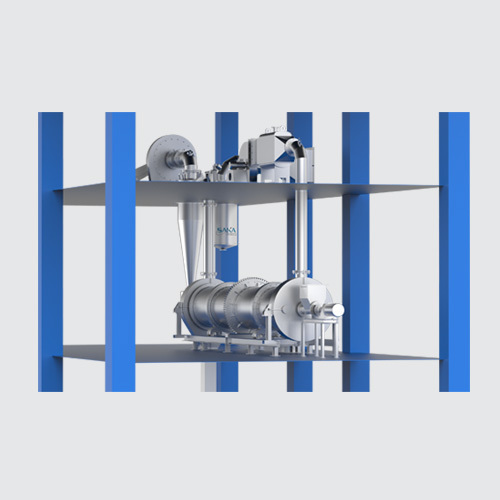 These dryers come with lifter or flights on its inner circumference to lift and distribute material. These lifter also facilitates material movement towards final discharge point. 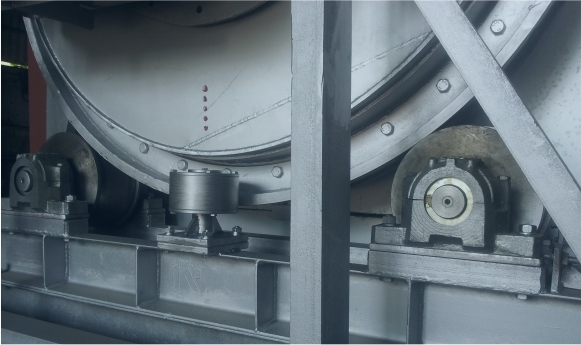 Rotary dryers are always aligned on slight slope to facilitate movement of material from feeding point to discharge point under gravity. 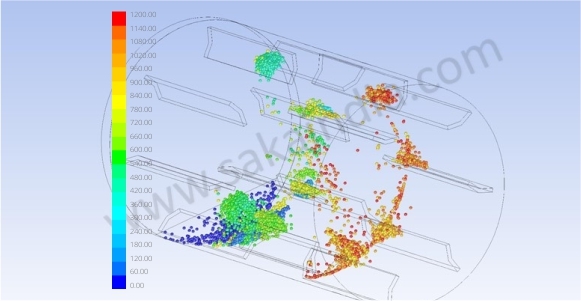 Our stringent quality standards and detailed CFD analysis ensures a consistent and enduring performance. 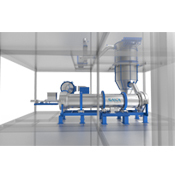 The Co-current type Rotary Dryer is ideal for the materials that has tendency to stick and has high moisture content. Here Air and feed are introduced from the same direction and material comes in contact of hot air at its highest temperature,which instantly evaporates surface moisture. The initial heat transfer rate is high, causing an immediate and considerable drop in gas temperature, which prevents overheating of the material and the dryer shell. The material which is in its final stage comes in contact of air/gas at its lowest temperature thus enabling the easy control over the moisture. 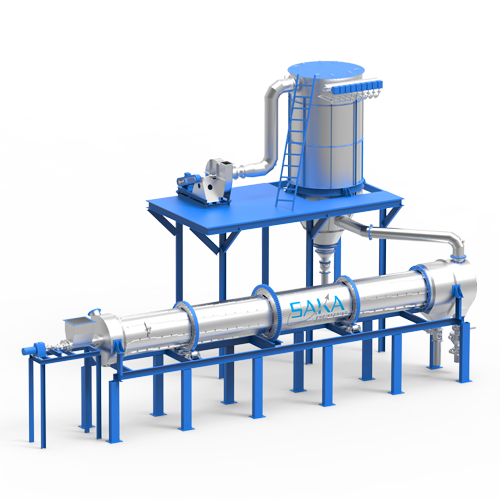 Counter current type of rotary dryer is an ideal solution for materials that must be dried to contain very low level of moisture. Here warm air is introduced at the discharge point of the Dryer. The material comes in contact with the warm air first at its lowest temperature, which goes on increasing as the material travels further. The material which is at its final stage comes in contact of air/gas at its highest temperature thus maintaining very low level of moisture content. 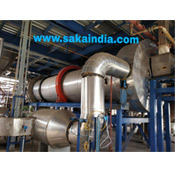 Directly Fired Calciners are used for high temperature application. The process usually has longer resistance time, The length of diameter ration is often in excess of 10:1 to control the temperature along the length of the Calciner. Burner fires directly from the discharge end of the dryer. The drying is achieved in three ways – by radiation from the burner flame, conduction from the refractory lining and convection by contact with the hot gases. In Indirectly Fired Calciner, material is heated with the help of the burners which are on the outer periphery of the dryer. Here, the heat is transferred by way of radiation and conduction through the cylinder wall. 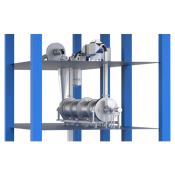 The rotary drum is partially enclosed and externally heated by a series of burners mounted in an insulated stationary chamber or jacket. Ideal for materials which require medium or low temperature, Indirectly Fired Calciners are used for drying dusty, fine or heat sensitive materials. 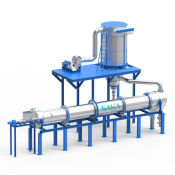 Tube Bundle Dryers provide effective and efficient drying for materials which require lower drying temperatures. Main element of these type of Dryers are steam heated tube, it dries the product by rotating inside a firm housing. 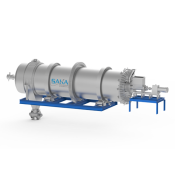 SAKA’s Tube Bundle Dryers are highly efficient and require less warm air to dry the product thus there is less emission of air. In Tube Bundle Dryers, feed comes in contact of heated tube and not directly heating medium. This makes is perfectly applicable for products which are free flowing and non sticky. Typically these Dryers are indirect type Dryer with counter current flow principle i.e. warm air flow in opposite direction of the feed. 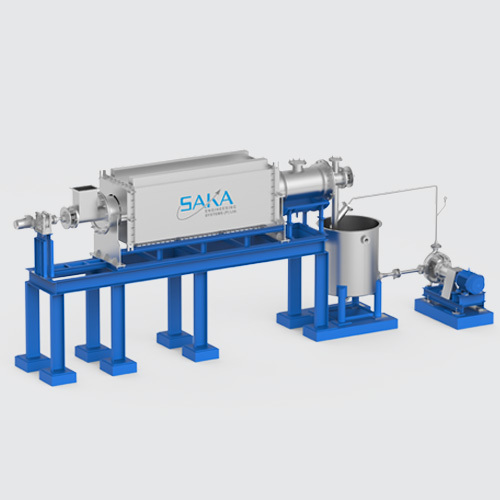 Conduction Dryers from SAKA are highly energy efficient. 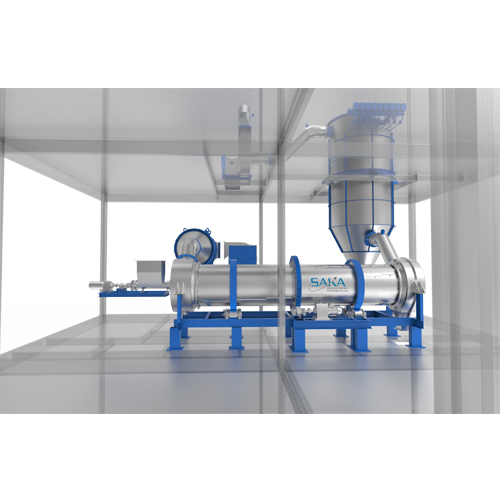 Ideal in case of heat sensitive material, Conduction Dryers offer controlled drying process atmosphere to ensure quality final product output. 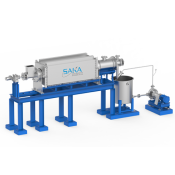 Conduction dryer transfers the heat by contact of two surfaces the metal wall and heat jacketed vessel with agitator. Using electricity as source of energy, jackets are heated up, which transfers the heat to the drying surface leading to controlled drying of feed. The Conduction Dryer comes with unique feature of sectional starting, which means you can heat up specific section of the Dryer giving very high quality product output, zero degradation of the product and excellent energy efficiency.